MSI's marketing department has created a series of slides to rebut Gigabyte's claim that its motherboards are PCI Express 3.0 ready. The company claims that out of as many as 40 of Gigabyte's PCIe Gen 3 ready motherboards, only the G1.Sniper 2 is really ready for PCIe 3.0. You can view all the slides at TechPowerUp. MSI begins by explaining that PCIe support isn't as easy as laying a wire between the CPU and the slot. It needs specifications-compliant lane switches and electrical components, and that you can't count on certain Gigabytes for future-proofing. MSI did some PCI-Express electrical testing using a 22 nm Ivy Bridge processor sample. 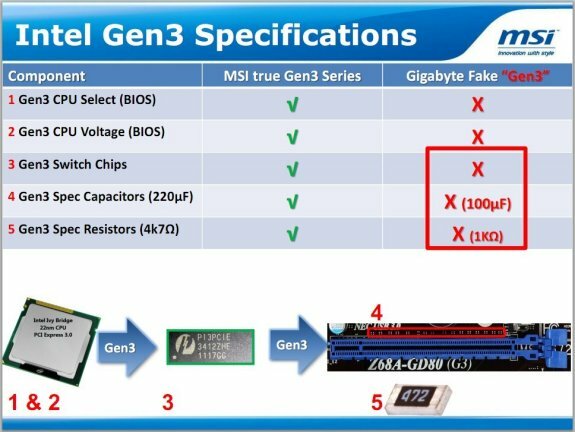 MSI claims that apart from the G1.Sniper 2, none of Gigabyte's so-called "Ready for Native PCIe Gen. 3" motherboards are what the badge claims to be, and that the badge is extremely misleading to buyers.